The Food Pyramid: Gone and NOT missed! 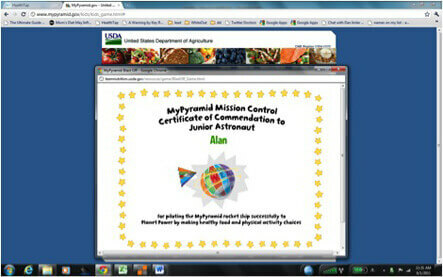 On June 1, 2011 I logged on to MyPyramid.gov for kids and played their Blast Off Game “An interactive computer game where kids can reach Planet Power by fueling their rocket with food and physical activity.” I registered as Alan, an 11-year-old boy. The results were slightly less horrifying than when I did this in 2006 (and reported my findings). But just barely. When you launch the game, you’re invited to select food items and physical activity for the day from a list that varies occasionally if you play several times. 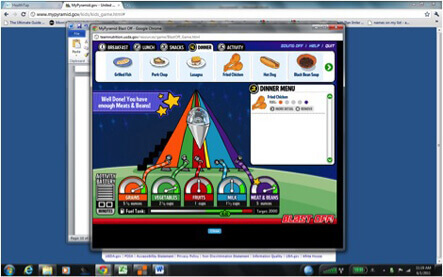 When you’re satisfied with your choices, press the Blast Off button and the game will analyze your diet to see whether it would give your body the optimal fuel to complete your journey. I was still hungry, so I added a white bread English muffin to my white flour and sugar breakfast. Being called a STAR PILOT is nice, so I went back and added some apple juice to my breakfast and chose apple juice for my afternoon snack, along with a glass of milk. I did receive an alert that whole or cut-up fruit is even better than fruit juice, the best advice I’d gotten so far. For physical activity I did some household chores. I set the table, I emptied the dishwasher, I made my bed, I put away some of my stuff. It seemed like it took an hour, but never got my heart pumping. Still, something seemed like it was missing from my dinner – from my whole day, really. And I knew just what it was: gravy! So I added an order of gravy for my fried chicken. That sounded so tasty that I chose a second order of gravy as well. My food choices made them happy. And to top it all off, I won a certificate! 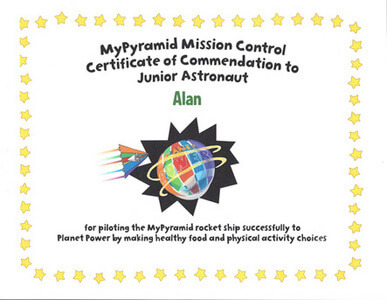 MyPyramid Mission Control Certificate of Commendation to Junior Astronaut Alan for piloting the MyPyramid rocket ship successfully to Planet Power by making healthy food and physical activity choices. And that is the story of how I came to hate the food pyramid and why I am celebrating its demise. Viva la Plate! Could this get any worse? See Part 2 of Alan’s Nightmare Food Pyramid Journey.